A Soho landmark since 1871 - when Soho really was the only place in Britain where you could eat decent continental food - Maison Bertaux is a charming little French deli and pattiserie, with half-a-dozen mismatched tables and an eccentric accordion-playing owner. Delicious cakes, croissants, croques and pastries are part of the appeal, but it's the atmosphere that makes all the difference. Not surprising, then, that every Central Saint Martin's art student sips their tea here including fashion designer Alexander McQueen - he's been coming here since his impoverished days as a tailor on Savile Row. Recently, the upstairs space has become an art gallery run by Tania Wade, typically showing the work of the arty types who populate the cafe downstairs. They, at least, won't have far to go to see thier fellow students' work. For the rest of us it's a perfect slice of Soho life. 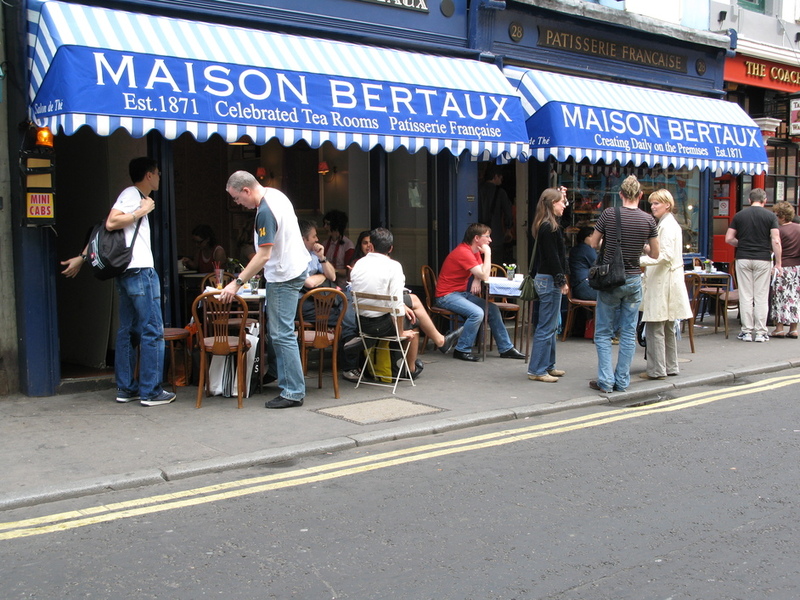 What are the best dining options near Maison Bertaux Gallery London? Maison Bertaux Gallery gyms, sporting activities, health & beauty and fitness. The best pubs near London Maison Bertaux Gallery. Maison Bertaux Gallery clubs, bars, cabaret nights, casinos and interesting nightlife. Where to have your meeting, conference, exhibition, private dining or training course near Maison Bertaux Gallery. From cheap budget accommodation to luxury 5 star suites see our discounts for Maison Bertaux Gallery hotels, including Radisson Blu Edwardian Mercer Street from 87% off.